Treat your taste buds to the most luxurious, sophisticated box of goodies. If there is one thing in this world that we can all appreciate, it’s chocolate. (Unless you happen to be allergic, which in that case, we ache for you). This is exactly why renowned chocolatier Pierre Marcolini has joined forces with Alexandre Mattiusi to create the most fashionable box of treats you’ve ever seen. Maison Pierre Marcolini has been the Haute Chocolaterie to beat since 1995. Not only are they known for their famous macarons and exotic ingredients, but are also an advocate for ethical sourcing. They ethically source Grand cru cocoa directly from independent producers in Brazil, Cuba, Ecuador, Ghana, Madagascar and Vietnam. Meanwhile, Parisian label AMI (named after its founder Alexandre Mattiussi) offers chic men’s clothes available from their stores in London, Tokyo and Paris. The two have combined their expertise to form a box that is homage to childhood. The box is decorated with AMI’s signature black and white stripes, and designed to resemble a 1950s TV. Inside the box is a sweet surprise of familiar faces: Pierre in front of his store and Alexandre rested on a scooter. The gorgeous selection of milk and dark chocolate are heavenly adorned with choice of hazelnut, pralines and nougat. And that’s not even all of them. As a nod to chocolate bars you had as a young one at school, all of the creations are about sophistication, with a blend with softness and crunch. 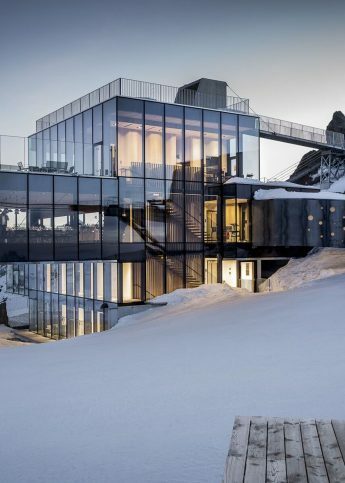 Das Central is the luxurious alpine hotel in Sölden with a licence to thrill. La Maison Rémy Martin private members bar sets up shop in South Kensington.